WELL DONE HUG!! 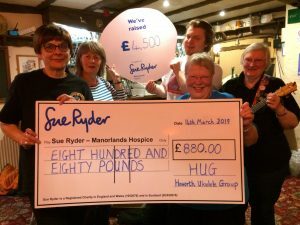 £4,500 RAISED FOR SUE RYDER MANORLANDS HOSPICE. HUG recently donated £880 to Manorlands bringing our fundraising total for the last few years to £4,500. Much of this was raised at a very successful gig at Sildsen Town and huge thanks got to the orgsnaisers there for putting it on. On top of that we’ve also fund raised for the Bradford Metropolitan Foodbank, Yorkshire Air Ambulance, The Bay Horse Pensioners Club, BAMHAG (a local mental health charity), and donated instruments to the Play for Cuba appeal. In total well over £6,000 raised for good causes. Thanks to all involved for their generosity and hard work in making it all happen. Haworth Ukulele Group is an informal and friendly group of enthusiastic ukulele players of varying levels of ability and musical styles. We’re growing all the time and currently about 30 people turn up for our regular sessions. We get together to strum, sing and have fun on the 2nd and 4th Thursdays of each month 7.30 – 9.30 p.m. at The Old White Lion Hotel in Haworth, West Yorkshire. So if you like ukuleles and you like having fun – Haworth is the place to be. We play all kinds of music spanning decades so come and join us for ukulele fun. All welcome – beginners and experienced players alike – just bring your uke and a sense of adventure. And if you haven’t got a ukulele yet but want to have a go just come along – we usually have a couple of spares with us. Take a look at our video gallery and you’ll see the kind of things we get up to.